Vietnamese temporary residence card for Turkish can be valid within 01 year or 02 years, must have a Vietnamese work permit to make a temporary residence card. If you are a business investor in Vietnam, you shall be exempted from a work permit. 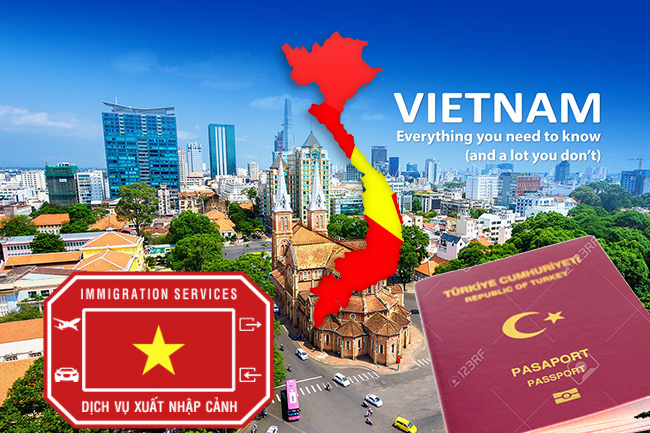 However, if you do not have a company in Vietnam to be guaranteed and have no work permit, we can make a 2-year temporary residence card, in order to perform this service, please contact us. To make a temporary residence card for Turkish having the last entry visa with the Labor sign (Visa with Labor sign). If you have been issued a work permit, your visas has the sign of DN, DL, TT and VR, you must remake the new visa official document according to the company issuing a work permit in order to have a Visa with Labor sign. Then you shall exit and entry into Vietnam to have the visa stamped with Labor sign. - Notarized copy of business registration. After having such official document, you proceed to the exit and entry for the visa stamp. However, you have to choose a gate to stamp: Noi Bai, Da Nang, Tan Son Nhat and Moc Bai. To remake a new passport, you must change the passport number on the temporary residence card, therefore, you remake the procedures for a new temporary residence card. However, you must correct on the work permit for passport number in advance. Reissuance procedures are similar with temporary residence card procedures. Firstly, you must go to the local police to declare for the confirmation by the public security, you must make 02 declarations. Then, make the visa on the passport to exit and entry into Vietnam. Then make a new temporary residence card as usual.